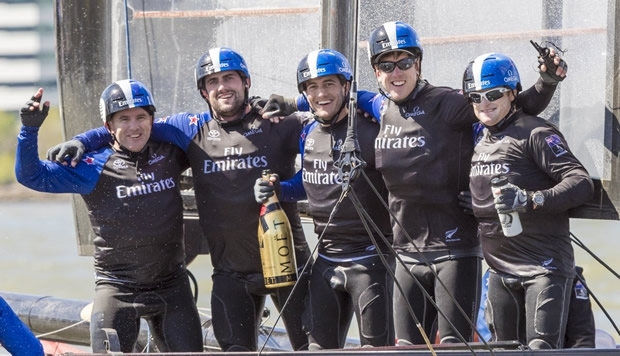 In a thrilling winner-take-all final race, Emirates Team New Zealand unhooked itself from a starting buoy to win the Louis Vuitton America’s Cup World Series New York with the high score of 52 points. Another large crowd, estimated at 100,000, turned out on a sunny day and was treated to some very unpredictable racing. This after over 75,000 came out on Saturday. No lead was ever safe today as the wind shifted through wide arcs between the west and north, ranging anywhere from 5 to 20 knots. The Kiwi crew, led by Ashby and Peter Burling, was literally dead in the water at the start of race 3. Crewman Blair Tuke had to jump in the water to unhook the starting buoy’s anchor line from the catamaran’s rudder. Making matters worse, the port hull was punctured by the buoy and water was leaking into the hull throughout the race. The Kiwi crew’s luck came full circle on the next-to-last leg. They rounded the last windward mark in fifth place, about 42 seconds behind leading SoftBank Team Japan. But as all the crews began the downwind leg they sailed into a patch of no wind that engulfed the course. As the leg was perpendicular to the southerly flowing current, some of the crews were being swept over the course boundary. Land Rover BAR, Groupama Team France and SoftBank Team Japan all were penalised for crossing the boundary in the current. The Kiwis, further behind, held in the middle of the course and when the wind filled in the Kiwis took off on their foils at 16 to 20 knots boatspeed, leaving the rest of the fleet floundering. At one point during the final race Oracle Team USA looked to be in position to win. Skipper Jimmy Spithill and crew won the start and led around the first two mark roundings. But Dean Barker’s SoftBank Team Japan grabbed the lead by working the right side of the course while Oracle Team USA struggled on the right side. In the end the reigning America’s Cup champion placed second in the race and second for the series. Third went to Franck Cammas’ Groupama Team France, winner of Race 2. SoftBank Team Japan placed fourth, Land Rover BAR fifth and Artemis Racing sixth. Illustrating just how challenging the day was on the short, confined racecourse, Nathan Outteridge’s crew won the first race going away, but was then sixth in races two and three. Sadly Land Rover BAR didn't get the result that it had hoped for in the extraordinarily fluky racing on the Hudson River. The combination of strong tide and a wind curling and darting around the Manhattan skyline was always going to make it difficult, but no one expected the result to be determined in quite the fashion that it was. Land Rover BAR had to settle for fifth in that final race and fifth in the event – a disappointing result after a succession of brilliant starts demonstrated how the team has worked on the single area of weakness during their event win in Oman. Ben Ainslie, Skipper and Team Principal: "It's hard to describe racing in those conditions. It was fantastic to see so many people out supporting the event. It's such a great city. The last two races, the guy in last place at the penultimate mark, won the race on the penultimate leg. "So as competitors that's tough to deal with, but that's the game. We knew it would be like that going into this event, and you roll the dice and see which side of it you come out. Unfortunately it didn't go well for us today, so the guys are frustrated. I think we sailed the boat really well, and did everything just about as good as we could, but it just didn't fall our way." The Louis Vuitton America’s Cup World Series now moves onto Chicago, June 10-12. After that it heads to Europe for events in the U.K. in July and France in September.